The non-biblical concept of original sin, as Claus Vistesen notes in this post, when propounded in its standard Obstfeld & Krugman textbook version refers to the situation where many developing economies who are not able to borrow in their own currencies feel forced to denominate large parts of their sovereign and private sector debt in non-domestic currencies in order to attract capital from foreign investors - as evidenced most recently in the countries of Central and Eastern Europe. Well, piling insult upon injury, I'd like to take Claus's point a little further, and do so by drawing on another well tried and tested weapon from the Krugman armoury, the idea of the "eternal triangle". As is evident, the reality which lies behind the current crisis in the EU10 is complex, and has its origin in a variety of causes. But one key factor has undoubtedly been the decisions the various countries took when thinking about their monetary policy and currency regimes. The case of the legendary euro "peggers" - the three Baltic countries and Bulgaria - has been receiving plenty of media attention on late, and two of the remaining six (Slovenia and Slovakia) are now members of the Eurozone, but what of the other four, Romania, Hungary, Poland and The Czech Republic? What can be learnt from the experience of these countries in the present crisis. Well, one convenient way of thinking about what just happened could be to use Nobel Economist Paul Krugman’s Eternal Triangle” model (see his summary here), which postulates that when it comes to tensions within the strategic trio formed by exchange rate policy, monetary policy, and international liquidity flows, maintaining control over any one implies a loss of control in one of the other two. In the case of the Central Europe "four", Poland and the Czech Republic opted for maintaining their grip on monetary policy, thus accepting the need for their currency to "freefloat" and move according to the ebbs and flows of market sentiment. As it turns out this decision has served them remarkably well, since the real appreciation in their currencies which accompanied the good times helped take some of the sting out of inflation, while their ability to rapidly reduce interest rates into the downturn has lead to currency depreciation, helping to sustain exports and avoid deflation related issues. The other two countries (Hungary and Romania), to a greater or lesser degree prioritised currency stability, and as a result had to sacrifice a lot of control over monetary policy, in the process exposing themselves to the risk of much more violent swings in market sentiment when it comes to capital flows. Having been pushed by the logic of their currency decision towards tolerating higher inflation, they have seen the competitiveness of their home industries gradually undermined, and as a consequence found themselves pushed into large current account deficits for just as long the market was prepared to support them, and into sharp domestic contractions once they were no longer disposed so to do. A second problem which stems from this "initial decision" has been the tendency for households in the latter two countries to overload themselves with unhedged forex loans, a move which stems to some considerable extent from the currency decision, since in order to stabilise the currency, the central banks have had to maintain higher than desireable interest rates, which only reinforced the attractiveness of borrowing in forex, which in turn produced lock-in at the central bank, since it can no longer afford to let the currency slide due to the balance sheet impact on households. Significantly the forex borrowing problem is much less in Poland than it is in Hungary or Romania, and in the Czech Republic it is nearly non-existent. The third consequence of the decision to loosen control on domestic monetary policy has been the need to tolerate higher than desireable inflation, a necessity which was also accompanied by a predisposition to do so (which had its origin in the erroneous belief that the lions share of the wage differential between West and Eastern Europe is an “unfair” reflection of the region’s earlier history, and essentially a market distortion). The result has been, since 2005, a steady increase in unit wage costs with an accompanying loss of competitiveness, and an increasing dependence on external borrowing to fuel domestic consumption. So, if we look at the current state of economic play in the four countries, we find two of them (Hungary and Romania) undergoing very severe economic contractions - to such a degree that in both cases the IMF has had to be called in. At the same time both of them are still having to "grin and bear" higher than desireable inflation and interest rates. In the other two countries the contraction is milder, the financial instability less dramatic, and both inflation and domestic interest rates are much lower. Really, looked at in this light, I think there can be little doubt who made the best decision. Here for comparative purposes are charts illustrating the varying degrees of economic contraction, inflation, and interest rates. 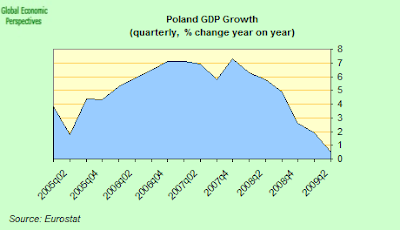 GDP contraction rates actually present a little problem at the moment, since one of the relevant countries - Poland - still has to report. However Michal Boni, chief adviser to the Prime Minister, told the newspaper Dziennik this week that the economy expanded at an annual rate of between 0.5% and 1% in Q1. So lets take the lower bound as good, it is still an expansion. 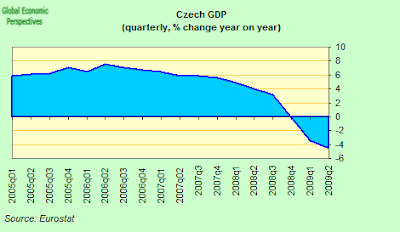 The economy in the Czech Republic contracted by an estimated 4.9% year on year in the second quarter. 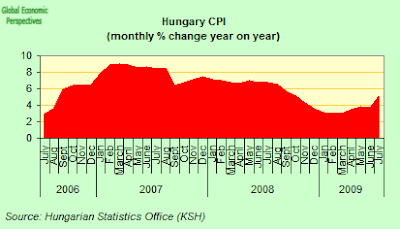 The Hungarian economy contracted by an estimated 7.4% year on year in Q2. 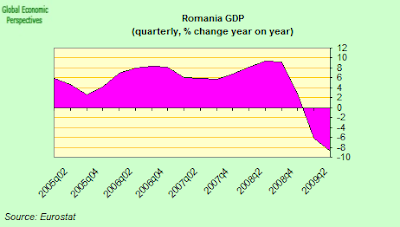 While the Romanian economy contracted by an estimated 8.8% year on year. Poland's CPI rose by an annual 4.2% in July. 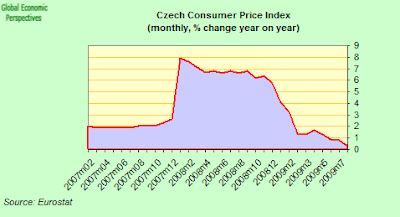 The CPI in the Czech Republic rose by an annual 0.3% in July. 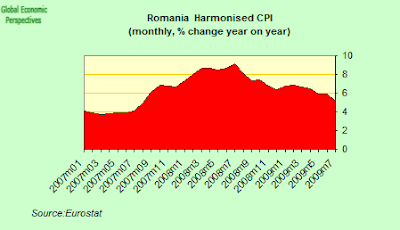 Romania's CPI rose by an annual 5.1% in July. Polands CPI rose by an annual 5.1% in July. The benchmark central bank interest rate in Poland is currently 3.5%. 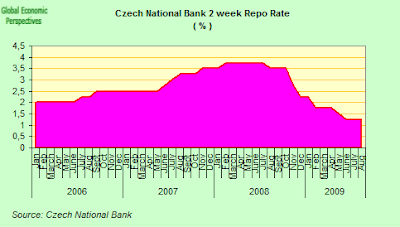 The benchmark central bank interest rate in the Czech Republic is currently 1.25%. The benchmark central bank interest rate in Romania is currently 8.5%. 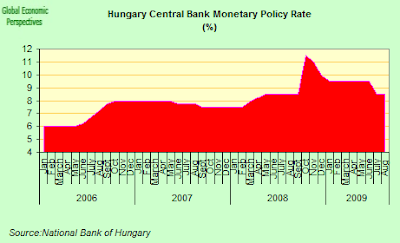 The benchmark central bank interest rate in Hungary is currently 8.5%. "Advances in Development Reverse Fertility Declines" - Science or Hocus Pocus? "One of the paradoxes of human biology is that the rich world has fewer children than the poor world. 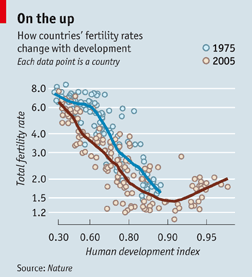 In most species, improved circumstances are expected to increase reproductive effort, not reduce it, yet as economic development gets going, country after country has experienced what is known as the demographic transition: fertility (defined as the number of children borne by a woman over her lifetime) drops from around eight to near one and a half. That number is so small that even with the reduced child mortality which usually accompanies development it cannot possibly sustain the population. If Mikko Myrskyla of the University of Pennsylvania and his colleagues are correct, though, things might not be quite as bad as that. A study they have just published in Nature suggests that as development continues, the demographic transition goes into reverse." Well quite a strong claim is being made here. The idea that a group of researchers have come up with a finding that shows the "rule....that people have fewer children as their countries get richer...no longer holds true" is certainly not one to be sniffed at. Such a strong claim needs some very heavy backing you would think, given all the research that has gone into the topic in recent years. and the total fertility rate (Tfr) at HDI levels around 0.85–0.9. The rest is only interpretation. As we will see, to move from a simple statististical correlation to formulating a hypothesis you need an explanatory framework, and you need to be able to make falsifiable predictions. The Nature letter from Myrskylä et al is far from being at this stage of development. They have simply found an interesting correlation, and the rest is in the eye of the observer. "Back in 1975, a graph plotting fertility rate against the Human Development Index fell as the Human Development Index rose. By 2005, though, the line had a kink in it. Above an HDI of 0.9 or so, it turned up, producing what is known in the jargon as a “J-shaped” curve (even though it is the mirror image of a letter J). As the chart shows, in many countries with really high levels of development (around 0.95) fertility rates are now approaching two children per woman. There are exceptions, notably Canada and Japan, but the trend is clear." However, according to the Economist the trend is clear. But is it? Edward has been doing some digging. In fact the problem goes beyond the Economist, since the source behind the article is a letter published in Nature. Below you can read that letter. "During the twentieth century, the global population has gone through unprecedented increases in economic and social development that coincided with substantial declines in human fertility and population growth rates. The negative association of fertility with economic and social development has therefore become one of the most solidly established and generally accepted empirical regularities in the social sciences. As a result of this close connection between development and fertility decline, more than half of the global population now lives in regions with below-replacement fertility (less than 2.1 children per woman. In many highly developed countries, the trend towards low fertility has also been deemed irreversible. Rapid population ageing, and in some cases the prospect of significant population decline, have therefore become a central socioeconomic concern and policy challenge10. Here we show, using new cross-sectional and longitudinal analyses of the total fertility rate and the human development index (HDI), a fundamental change in the well-established negative relationship between fertility and development as the global population entered the twenty-first century. Although development continues to promote fertility decline at low and medium HDI levels, our analyses show that at advanced HDI levels, further development can reverse the declining trend in fertility. The previously negative development–fertility relationship has become J-shaped, with the HDI being positively associated with fertility among highly developed countries. This reversal of fertility decline as a result of continued economic and social development has the potential to slow the rates of population ageing, thereby ameliorating the social and economic problems that have been associated with the emergence and persistence of very low fertility." Here is the chart (reproduce from Nature data) which the Economist presents to illustrate the 'J curve' relationship. Nice, isn't it? Nature even go to the lengths of a putting up a special "event" podcast featuring an interview with Hans Peter Kohler (click here for link) as if to underline the importance of the "finding") But does any of this have any compelling validity? Methinks not as much as the authors of the letter, or those who are covering it in the media, are trying to make out. There are many issues which are raised here, but I would just like to mention three. The first is the decision of the research team to work with a period based fertility measure which is known to be very unreliable for "tempo" reasons (the Total Fertility Rate- Tfr) as the basis for a longitudinal study. And let us remember, the authors only really claim to have found a correlation between HDI levels in the 0.85–0.9 range and movements in the Tfr, and there could be many explanations for this. Indeed the authors themselves even offer one of them in their supplementary information - "countries at development levels near the critical level HDI = 0.86 might have a more rapid postponement of childbearing than more advanced countries.. " - a possibility which, in fairness to the authors, they try to test for. And you don't have to rely on me for the suggestion that the Tfr is hardly the most desireable measure for what they want to do, since the authors themselves point this very fact out in the supplementary information (and the only thing which surprises me is that nobody else who has reviewed the research seems to have twigged the implications of this). So the very title of the Letter is totally misleading, they have not found that "Advances in Development Reverse Fertility Declines" -since in the first place the direction of causality is not adequately determined (it might be that reverses in fertility decline advance development, as I try to show in a piece referenced below) and in any event the research only shows movements in the HDI correlate with movements in the Tfr (and not with "fertility"). The recent literature on low fertility in developed countries has pointed to the important role of delayed childbearing, that is, the ongoing postponement of childbearing to increasingly later ages. In the context of this paper, delayed childbearing is potentially important because the postponement of childbearing can distort the total fertility rate as a measure of the quantum (or long-term level) of fertility. 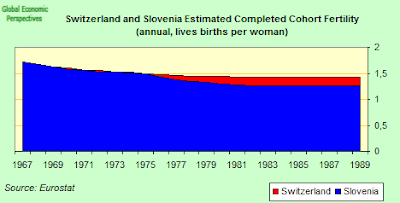 “Tempo effects”, or the reductions in the total fertility rate resulting from a postponement of childbearing, have been shown to partially explain the very low fertility rates observed in some European countries. So this is the first issue. 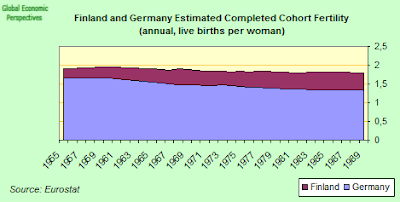 Due to the phenomenon of birth postponement, the Tfr is a hopelessly unreliable indicator, and what is often called "the birth recovery" is in fact a statistical issue produced by the fact that the Tfr first sinks to very low levels (the birth dearth) and then recovers as women reach the new (higher) childbearing age. 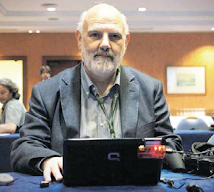 Since all of this is simply so obvious, I am absolutely astounded that two such well known and highly respected demographers - Hans-Peter Kohler and Francesco Billari - have placed their name on a piece of research that could almost be described as a publicity stunt. I am even more astounded by the way Nature appear to have been hoodwinked. Basically, I don't think that there can be any doubt that if they used a more comprehensive measure of fertility - say completed cohort fertility - they wouldn't get the correlation they claim to have found, since CFRs never fell so low, and have not bounced back in the same way. This is essentially because this indicator removes the temporal component found in the TFR (older first birth ages among women in developed societies) and only focuses on quantity. True, they did carry out a robustness test using an adjusted Tfr, but the results are much weaker, and the sample far from satisfactory (at least for the claims being made), and the authors well know this (see below). In their longitudinal study the authors look at Tfrs for a number of countries over the period 1975 to 2005 and compare these to the lowest Tfr reading observed while a country's HDI was within the 0.85–0.9 window. For all countries considered, the HDI in 2005 was found to be higher than the HDI in the reference year. For 18 of the 26 countries that attained a HDI 0.9 by 2005, the Tfr in 2005 was found to be higher than the TFR in the reference year. As I say, this is hardly surprising, given the tempo impact on Tfrs. The "2005 18" are Norway, the Netherlands, the United States, Denmark, Germany, Spain, Belgium, Luxembourg, Finland, Israel, Italy, Sweden, France, Iceland, the United Kingdom, New Zealand, Greece and Ireland. Perhaps it is more surprising (and interesting) to learn that they found six countries where the HDI was over 0.9 but where the Tfrs didn't pick up: Japan, Austria, Australia, Switzerland, Canada and South Korea. Clearly the absence of "rebound" in even the Tfrs is something of a cause for preoccupation in these countries, and examining the background to what is happening in these countries could at the end of the day turn this research into something quite interesting. That is to say, if for their level of development we might have expected the tempo effect to be more or less over, why do some countries continue to have very low fertility levels? Basically, to shoot a hole straight through their hypothesis (falsify it that is, surely in science things should be falsifiable), I would say it is only necessary to find a significant number of countries in the first group where fertility as measured by a better indicator didn't rise. Unfortunately we don't have a really good time series for such an indicator, but Eurostat have published statistical estimates for Completed Cohort Fertility Rates (Cfrs) for EU countries up to the 1989 cohort. 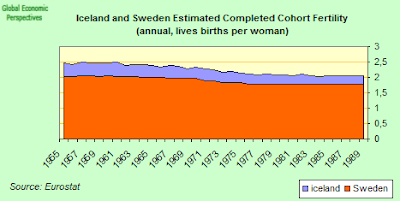 That is, estimates of what fertility is likely to be for women who were 30 in 2009. 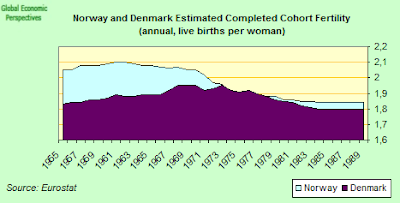 Looking at this data, the following countries would appear to offer no evidence whatever for a rebound in cohort fertility in what we know to dat: Norway, Netherlands, Denmark, Germany, Italy, Finland, Sweden, France, Iceland, the UK, Greece and Ireland. That is to say, as far as I am concerned, the whole hypothesis falls till at least subsequent data confirm it. I haven't been able to check foir the US (but the Cfr is probably up) Israel (also) or New Zealand. Belgium has little available data. So the only two European countries which you could say with some degree of security actually could confirm the hypothesis would be Luxembourg and Spain - but if you just look at the increases in Spain - from 1.34 to 1.35 - and think about the fact that 5 million new migrants arrived (mainly in childbearing ages) between 2000 and 2009, then the result is hardly dramatic, and if you look what just happened to the economy, it is more than likely that GDP per capita is plummeting, and and household income (which has a weighting of more than one third in the HDI) with it. Which brings me to the second question, the reference year. But before I move on to that, as I say above, the authors are perfectly well aware of the issue with using Tfrs. In particular, one could speculate that tempo effects might be—at least partially—responsible for the observed change in the development–fertility association. For example, countries at development levels near the critical level HDIcrit = 0.86 might have a more rapid postponement of childbearing than more advanced countries. If this were the case, tempo effects would reduce the TFR more strongly at intermediate than at advanced HDI levels, and the positive association between HDI and TFR in Figures 1–2 could be partially explained by differences in the pace of fertility postponement, rather than by variation in levels among advanced countries. The authors therefore carry out a robustness test which effectively amounts to a cross-sectional study (cross-sectional note, not longitudinal) of the relationship between the total fertility rate with and without adjustment for tempo effects, and the human development index in 1975 and 2005. 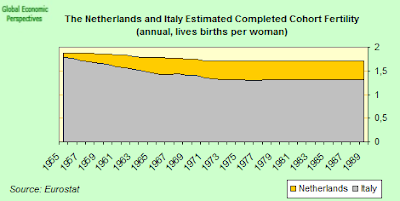 Tempo adjusted TFRs are not available over the period in question so they simply took data for 2005 (for those countries for which it is available from the ’European Demographic Data Sheet 2008’ (published by the Vienna Institute of Demography, Vienna, Austria) and from McDonald P, Kippen R. The Intrinsic Total Fertility Rate: A New Approach to the Measurement of Fertility (Population Association of America Annual Meeting 2007, New York, 2007). 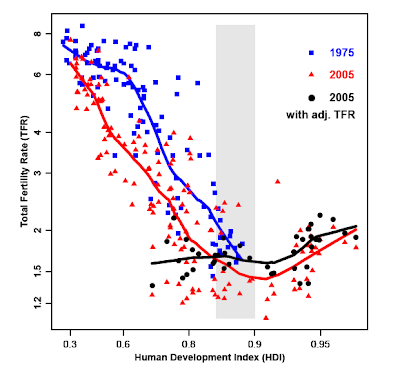 What they can then show is that the HDI–TFR relationship at persists at advanced development stages persists even after adjusting the total fertility rate for tempo effects. But, as I say, this is cross sectional, not longitudional. What does this jargon mean? It means there is no clear causal relationship, since equally it could be better HDIs which is driving better fertility, and hence you can use the HDI to explain differences between countries if you wish, but not the evolution of fertility in individual countries. The 2005 result is show as a black line in the chart below, where you can see that as HDI goes up, Tfr also seems to be higher. Which is very much to the point, and brings me to my second issue, since in my blog post "Taking Solow Seriously - Does Neoclassical Steady State Growth Really Exist?" (which you can find here) - I demonstrate using a few simple charts that the evolution in GDP per capita (which accounts remember for one third of the HDI) may well be a function of underlying population dynamics, since three countries with stronger population growth and higher fertility (the US, the UK and France) evidently perform much better than three will low-to-negative population growth and very low fertility (Italy, Japan and Germany). Also, it should be remembered, as I mention, we need to think about base years. 2005 was the mid point of a massive and unsustainable asset and construction boom. I think there is little doubt that if we took 2010 or 2011, the results would be rather different. "Dr Myrskyla’s data, however, suggest the ultimate outcome of development may not be a collapsing population at all but, rather, the environmentalist’s nirvana of uncoerced zero population growth." I want to stress, I certainly think this stationary population idea is certainly one possibility in the more highly developed nations - but if we move to stationary populations, with higher and higher proportions of the population in the older age groups the result is - as we know - a rising median population age. It is the economic impact of the abrupt rise in median age that I personally am focused on, and how just this rise, and the resulting fall in living standards for many young people, might feedback in a negative way on fertility and thus produce ever more rising median ages. In recent days, some have been asking why people like myself are so focused on what is going on in Latvia, which is after all, a pretty small country. Well, I think here in the issues raised by the Nature letter we have just one more reason why that country is important, since in a sense it is conducting a "live" experiment. Finally, I want to say, none of the above should be read as suggesting that there isn't a great deal of interest and material to talk about in the study the authors have carried out. Nor would I hold them entirely responsible for the way in which others have used and abused their work. I just the reserach doesn't demonstrate what they want it to demonstrate, and that the study doesn't deserve the kind of high media profile it has been receiving, since it is going to mislead the general public more than it will enlighten them, given the important methodological issue which are still to be clarified. The heart of the problem is twofold. The excessive reliance on a rather problematic indicator (the Tfr) and the causality issue when it comes to GDP per capita and higher fertility (which way does the arrow point?). In fairness the authors do attempt to construct their own combined time series based on a mixture of tempo-adjusted Tfrs and Tfrs, a procedure which seems at the very least to be somewhat problematic if you want to reverse fifty years of academic consensus. And they do get the same sort of result, but the outcome is much weaker and is based on a much smaller sample of only 25 countries. But even this result is at the very least odd, since, as I argue above, cohort fertility hasn't really increased in most of thecountries concerned. So I think we really all need to see more details of how the authors actually constructed the time series to be able to form a better judgement. But all this being said, and whatever the original intentions of the authors, serious scientific debate does seem to have been turned here into something of a media circus. Wasn't it blogs that were supposed to do that? 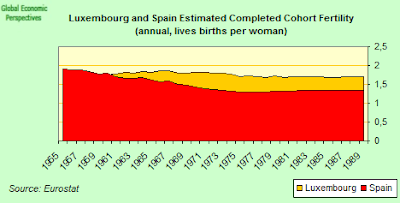 Below I offer a series of charts showing estimated completed cohort fertility rates based on data compiled by Eurostat using the distribution of births by parity (first and second or higher order births) and mean age of mothers at respective parities to carry out the calculations. 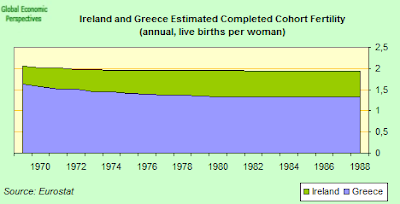 Evidently, the most recent data for hard data on completed cohort fertility comes for the 1960 - 1965 cohort. These charts should not be treated as hard data, but a rule-of-thumb type quick visual inspection suggests that it is hard to accept the case for a substantial fertility rebound in many European countries.